With the excitement on monday about the imminent arrival of Saga , the new Dark Ages rule system from Gripping Beast , I couldn’t resist giving the game an outing tonight with 2 gaming friends away from the club, especially as I won’t be down on 3rd October when we all plan to give it a run out. The scenario a slight variation on Clash of Warlords from the scenario section with a force of raiding Vikings looking to get to the Priest’s residence near the Church and the Anglo-Danish force looking to stop them. The Rules suggest using 4 points for a starting game with 1 point being either 4 Hearthguard (Hirdmen or Housecarls) , or 8 warriors (Bondi or Ceorls) ,or 12 levy (Thralls or Geburs) . The hero or warlord comes for free. Having unpacked the basic 4 point forces as in the book 2 units of Hearthguard and 2 units of warriors each and characterised them by converting 1 unit of Viking Hearthguard to Beserkers ( it just had to be done) and 1 of the Anglo-Danish Hearthguard units to having 2 handed Dane axes, I decided it just didn’t look enough for an evenings play so upgraded to 5 points by adding 8 more Ceorls to the Anglo-Danes and 4 more Hirdmen to the Viking marauders. Steve and David diced for sides with David winning the Vikings. They then deployed with Steve spreading himself across in front of the buildings with the Ceorls to the fore the Housecarls acting as a mobile reserve with his warlord. David opted to reorganize his forces combining all the Hirdmen into 1 larger unit( the units bought as points don’t have to stay as they were purchased but can be combined or split as desired, as long as the same type of troop is in the unit on the table and the size is between 4 and 12) and using these with the Warlord and nearby Beserkers as a core depolyed to punch up the centre whilst screened by the Bondi on the flanks. With that we were off! The first turn for both sides was used to familiarize all 3 of us with the use of Dice and battle boards with David managing to use the leader’s special abilities ,” Determination ” and “We Obey” to move the Warlord and his Hirdmen for free he then moved them both again acquiring both a fatigue point for undertaking a 2nd action. the Beserkers also moved forward as did the Bondi on the flanks with 1 unit moving twice to get into the small wood also acquiring a fatigue point. The Anglo Danes just used their activation to move themselves around slightly adjusting their initial deployment to meet the threat with 1 unit of Housecarls moving o cover the edge of the wood. They didn’t acquire any Fatigue points. A few words on fatigue points here, they are used to represent both fatigue due to activity , being acquired for doing lots of activity and also fighting in melee, as well as reflecting a degree of morale as they are picked up when nearby friends are cut down. Units can carry so many before the effects are felt and they are used up by your opponent to his benefit, more on this later. The second turn saw a further general advance by the Vikings , but the saga dice were used to activate the “Njord” effect which removes 1 fatigue from the warlord and any unit within M ( medium distance or 6″) of him, making the formidable Viking centre refreshed as it arrived within charge distance of the Anglo Danish troops. Anglo Danish activity in Steve’s 2nd turn focused on moving his troops up to support his threatened Ceorls and pushing the Housecarls into the woods on his right flank to stop a sneaky Viking outflanking manouvre. he also noticed the chance to pop the threatened leading unit of Ceorls into “Shieldwall” in front of the Beserkers by discarding 2 of his Saga dice. With them bolstered he sat back and awaited the inevitable onslaught. Not wanting to disappoint David promptly moved the Besrkers into contact as well as the Bondi in the woods , but misjudging the distance slightly and also by totally losing sight of 1 figure in the woods didn’t manage to get all his figures into combat (base to base or within Very Short distance or 2″ of an engaged enemy model). 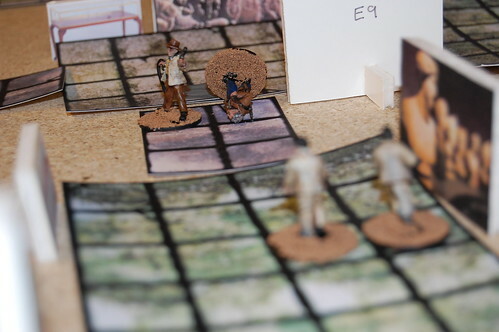 Following the Melee procedures the Bondi in the woods managed to generate 5 attack dice with 5 of the 8 figures engaged, but the Housecarls were all engaged allowing them 8 dice for their 4 figures. David rolled well needing 5’s and 6’s to hit the superiorly trained and armoured Housecarls managing to get 3 hits Steve meanwhile got 4 hits needing 4’s or better. the Vikings activated their attack pool to boost their defensive pool and so saved all but one of the hits on 5 or 6 as did the Housecarls without any boosting of their dicepool. As it was a tied melee the Bondi bounced off with both sides gaining a fatigue point. We now resolved the Beserkers charge expecting great things. 3 engaged Beserkers generated a whopping 12 dice against the Ceorls 8 for the whole unit however the Beserkers offensive prowess was offset by their armour value and hence target number being a mere 3 to hit! A rather below par set of rolls by David resulted in all 4 Beserkers dying as even unengaged models can be killed against 5 of the Ceorls , rather a disappointment. the consequence of this was that the Hirdmen and Warlord both acquired a fatigue point for seeing their mates cut down. Steve at this point chose to adjust his deployment and remove fatigue points as well as set up some nasty surprises using his Saga dice abilities., for Davids next turn. The Vikings , completely in character charged in wherever they could except for the leader who rather Cravenly hung back ( Not favoured of Odin this one methinks!) although he did use “Loki” in the orders phase to force the remaining Ceorls of the Beserker combat to flee. The combats went in favour of the Vikings this time with the Housecarls in the woods being cut down but being too far away to have any adverse effects. A unit of Ceorls in the centre losing the melee but due to the “Unforgiving” trait (the nasty surprise mentioned above) popping an extra 2 fatigue points onto the Hirdmen on top of the usual 1 for melee making them now exhausted ( different quality troops can accumulate different amounts of fatigue before becoming less effective or exhausted). Sensing that the tide was turning as the elite of the Viking Raiders were now exhausted or dead in the centre Steve moved in for the kill. His warlord and the Dane Axe armed Housecarls charged the remaining untouched Bondi on Davids right wiping them out without any losses to themselves and heaping more fatigue onto David’s Hirdmen and warlord. He also used the “Exhaustion” ability to remove 2 of the exhausted Hirdmen making the Viking centre very weak. The result was almost predictable with the Viking Hirdmen being cut down , the warlord now finally involved in the fight, but exhausted from controlling his forces had little chance and perished taking 5 hits although he saved 2 of them with his defensive rolls the resulting 3 hits together with having no living friends nearby meant that even the “Resilience” ability couldn’t save him and he went to Valhalla sword in hand. He did however manage to finish off the Anglo Danish warlord as Steve had a horrid set of defence rolls failing all 3 so even the presence of 1 nearby Housecarl couldn’t save his own warlord. A clear Anglo Danish victory as the surviving 4 Vikings were in no position to continue heavily outnumbered and still a long way from their objective and leaderless, while the Anglo Danish forces were still over 50% strong despite their warlord’s noble sacrifice. All in all a fun nights game. There is a lot of complexity in the battle boards and it would pay to stick to 1 faction for a while to learn how to use them. Management of fatigue is absolutely key as we found out when the Hirdmen got slaughtered due to their accumulated fatigue levels rendered them ineffective. It will be interesting to play with some missile troops to see how they can break things up , but that will involve some more painting on my behalf as I don’t have enough at present but now I have the incentive to do so as this is one set of rules that I want to play a whole lot more. I guess typical for most clubs our scenery tends to the rural – the fields and villages of Normandy; the jungles of Vietnam; the rugged wastes of some fantasy landscape. Ancient ruins add to the mix but essentially mud and grass are the order of the day. There are plenty of reasons, though, to want a more urban setting. We like a bit of pulp gaming and a few of us are looking at 7TV as a system. Superheros are rarely found meandering around the leafy lanes of wiltshire. Many WW2 conflicts were based in hotly contested towns and cities. However, a few hedges, village houses and trees are not all that expensive. Several blocks of Manhatten real estate if done is resin would be. 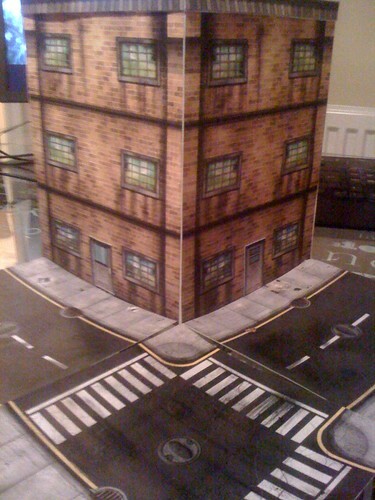 So, I decided to shell out for some templates from World Works Games – their streets of mayhem range. This is a very US focussed range, but could proxy for some European cities as well. The roads need sticking to some foamboard for rigidity, but the process was pretty simple and the building looks pretty cool. I guess my major concern is storage – these are big old blocks and within a short space of time, they’ll be taking up most of the garage if not careful! Anyway – not a bad start and I’ll certainly be printing and sticking some more of these. Thoughts on Hail Caesar – two games in. Quite a few of us at the club have been interested in Hail Caesar and it has been good to get some games under the belt to try it out. There are some established or growing Roman armies already in the club so I went for a hairy Celtic horde, including naked fanatics. Paul and I have now played two games using the rules. Our forces have been on the small side for what looks like a typical HC game (at least from the book examples anyway) but we’ve had enough to play a decent sized game with 3 small but useful divisions. Game 1 was played across the width of a table with not a lot of scenery and essentially was a smash into each other and kill much as possible game. We had a lot of fun, and learned a lot about the importance of supporting units and maximising dice rolls. We screwed up a lot, got other stuff and had a lot of fun. Game 2 was a completely different affair. This time we had the celts advancing down the length of the table into a roman force defending a river crossing. This game really showed the system in all its glory. We had proper skirmishing, impetuous cavalry, units failing orders and getting lost, huge battle lines crashing into each other, massive damage and desperate last stands. Joined by Dan, all of us had plenty to think about as we moved around the table, lined up charges and generally tried to take advantage of opportunity and adjust to the winds of misfortune and blundered orders. Some observations. We had great fun and were really impressed with the system. Units behaved as you’d expect and once we got to game 2 the tactical options came to the fore and presented some real challenges. It was obvious that an effective skirmishing phase is important and you need to think carefully about the role of different forces when planning your move from skirmish to serious combat. The game punishes wrong or poor troop handling. For example. In game 2 I got my celts into a double move charge range, and then my general rolled once and then again but only got a single order. This left the carefully managed battle line within initiative charge range of the romans who piled in and smashed the Celtic line backwards. Losing the +1 to the hit role for charging was vital and meant the celts couldn’t max their dice rolls. On the other flank Paul ended up with his auxilia in the front line with Pretorians providing support. This was asking for trouble and the resulting melee was all too easy for the celts who smashed the auxilia off the table and inflicted heavy casualties on the supporting Pretorians. Had those two units been the other way round, the result would likely have been very different. So much for us to learn and more games needed. That’s good then! We agreed that we need (well, want…) bigger armies, bigger tables and more time. The prospect of truly epic battles is really enticing. So, really enjoying the system, the Warlord figures are just awesome and there is so much more to find out and have fun with. Last year I ran a fun 4 part pulp campaign. This year I have been helping Andy shape a new series and we ran game 1 this week – a treasure hunt in the British Museum. The Germans – can’t have 1930s without evil Nazis. Our first campaign introduced the wonderful Hans und Karl – two hit men employed by the Nazis to undertake all sorts of nasty secret missions. Much hilarity around these two, but they are also hard as nails. The cultists – always conspiring to bring an end to the world, their efforts in campaign 1 were thwarted by Alan and his arab allies. But, there is always another plot around the corner to get excited about. So, on to the first game of series 2! Each of our factions becomes aware by various means of two artifacts of significance which can aid their current work – though for Alan, the objective is to protect these. The artifacts are believed to relate to some mysterious cattle deaths in the US – hundreds of cows are found slaughtered but with no obvious cause. Both artifacts are located in the British Museum and it so happens that whilst Alan is protecting them, the cultists and Germans happen to launch raids at the same time to steal the objects! So, all the factions descend on the British Museum – let mayhem commence! So, Alan, Prof. Eric Brown and some students started searching exhibits at one end of the museum whilst the cultists crept through the sewers under the building. Meanwhile the germans abseiled from their stealth zeppelin – but disaster! Hans und Karl with one Kommando made it to the roof, but Prof. Kaffenbach, Ivan and the other Kommandos landed in the courtyard. Continuing to search the exhibits Alan and the professor discovered some ancient Mayan artifacts that seemed important. Hans und Karl got off the roof and met up with the other part of their group and proceeded to help Professor Kaffenbach to explore the exhibits. He must have left his monocle in the zeppelin as he couldn’t make head nor tail of the exhibits. Meanwhile the cultists emerged from the sewers and quickly found more Mayan artifacts. The Germans moved through the museum and engaged the students supporting Alan and Prof. Brown. One student is hit and the others become pinned behind cover. The Germans press their attack with Karl leading the assault. 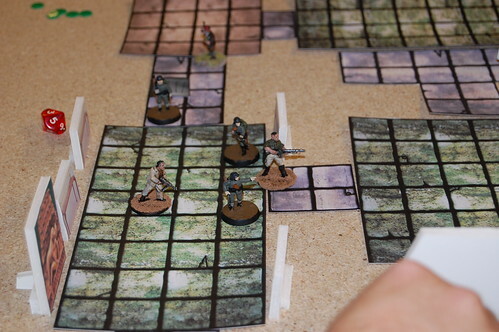 Leaving the students to hold off the German forces Alan and Eric head through the museum to confront the cultists. 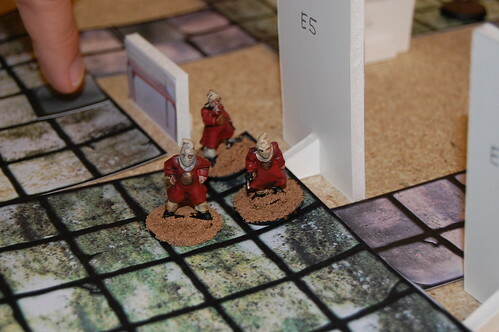 They exchange fire with the cultists and are forced into cover. Unfortunately for Professor Brown, Hans is able to sneak past the students covering fire and takes up a position behind the professor. Caught in cross fire from Hans and the cultists Eric goes down under intense fire! Alan, seeing his friend go down rushes forward to help and take down his opponents. Meanwhile the Germans and cultists exchange fire on the other side of the museum. 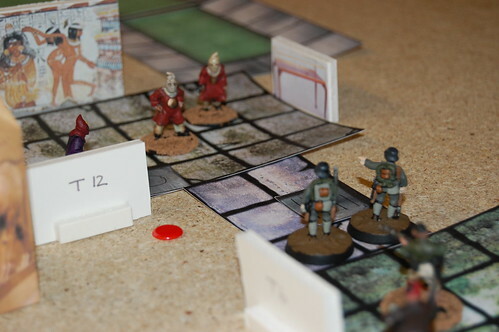 The Kommandos lose one man, but the cultists suffer for their insolence. Professor Kaffenbach still fails to find anything useful and with the sound of approaching police and army reinforcements outside, time is running out. 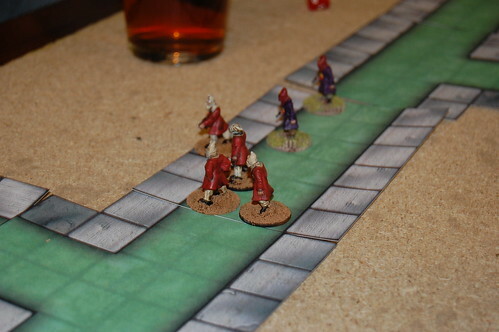 The cultists begin to withdraw with their booty and head back to the sewers. 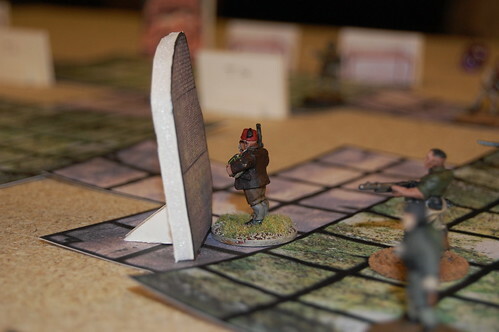 A brave Kommando follows but is cut down by Brother Socrates – the cultist leader. Hans assaults the final student and takes him out. Karl is able to land shots on Alan. Alan doesn’t go down but with the professor out for the count and all the students dead things are looking bleak. Withdrawing to the stairs Alan seeks a way out, leaving the museum to the Germans. Hans und Karl seize Eric Brown and head back to the zeppelin with Kaffenbach and Ivan as the police storm the entrance. The cultists made off with the most useful haul of artifacts and will have an advantage in the next game. The Germans failed to find anything but have captured Eric Brown and will be able to find out what he knows about the mysterious goings on. Hans und Karl are beginning to doubt the loyalty and value of Kaffenbach and Ivan though after their poor showing in the museum raid. Alan, in typical fashion, finds himself without allies and with his best friend once again in German hands. How will he recover from this setback? The various clues all point to something happening in British Honduras. So, we are off to Central America! Will Alan be able to get someone to help him rescue the professor and get to the bottom of what is going on? Will anyone still want to be his friend? Will the Germans get the information they need from Eric Brown. Do Hans und Karl trust Kaffenbach or will he suffer an unfortunate skydiving accident over the Atlantic? What is Ivan all about and why is this Russian refugee tagging along with Kaffenbach? How will the cultists respond to their hard won information? Will the Spanish arm of the cult prove as dastardly and bloodthirsty as their European brothers? And most important – what lies in the Honduran jungle that could be of such importance. Find out in the next game!! 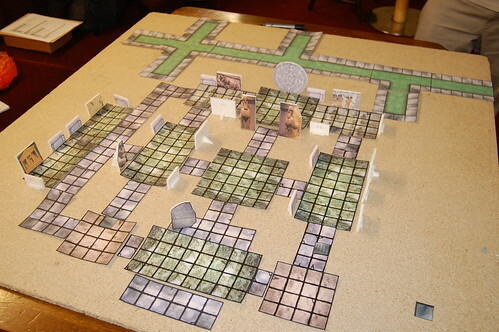 We used the latest edition of the .45 Adventures rules for this game. Much improved over edition 1 the new rules are much quicker to play and deal with multi-group games well. Previously the book keeping could bog a game like this down, but the revised d10 mechanic and approach to level 1 chars, hero points and combats made life a lot easier and the game ran smoothly and quickly.